What does dE code mean on LG washing machine? Is your LG top load washer getting the dE error code? The dE error code on an LG washer is indicating the washer door was not able to properly lock the door. This signifies 3 different issues that may be causing the dE error code. How To Clear? – What To Check? – How To Fix/Repair? LG Washer dE Error/Fault Code. 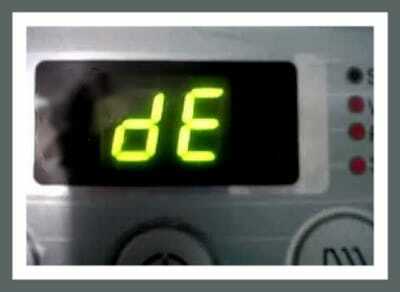 The dE code will look like this on the Washer’s Display Panel. The LG Washer dE error code indicates the washer cannot lock the washer door. – The door is not aligned properly. – The washer door was not closed properly. – The washer’s door latch may be faulty. 1 – Press the POWER button to turn washer OFF. 2 – Remove the washer from power. 3 – Press and hold the START/PAUSE button for 5 to 10 seconds. 4 – Apply power to the washer. 5 – Turn the unit back on by pressing the POWER button. 6 – Open and Close the washer door, making sure the door has latched. 7 – Select a wash cycle and press START/PAUSE to test the washer. – DO NOT put weight on the washer door when open. – Pushing on the door when OPEN can BEND the door hinge therefore not letting it shut or close properly. – The washer drum should not be packed with clothing which could cause the door out of alignment. – Put clothing far into the washer drum so no parts of the clothing are trapped between the door and outside the door. Make sure the door is aligned properly and not bent. If the hinges on the washer door have been bent, you can try bending it back into position. If unable, you will need to install a new washer door hinge. FAULTY WASHER DOOR LOCK ASSEMBLY? If the door is shut properly and you continue to get the dE error code, you need to see if the wiring harness that go from the door latch to the control board are secure and not damaged. You may need to remove the door latch and check for damage and use a meter to be sure it is receiving power. If you suspect the LG washer door latch to be faulty, replace it. Have questions about LG washer getting the dE error code? Please leave a comment below and we can assist in troubleshooting. We keep getting the DE error code when we start a load. We followed the instructions and nothing helped. Is the washing machine supposed to make 2 clicking sounds? Hello, just got the dE error and have tried it all and it just keeps clicking and stops. All hinges look completely aligned and the lock is getting power since it is clicking twice before giving me the code again. Any suggestions before buying a lock for no reason? I have an LG wm227hw. I keep getting the de error, but not at the beginning of the cycle. It keeps stopping mid-cycle. Sometimes I can get it to go all the way thru the cycle, but not very often. The door seems to be latching just fine. I have not opened it up to check the wiring harness. If it’s a problem with that what part do I need and how can I tell. Someone also suggested that it may be the control panel that needs to be replaced. I’d love to get this part ordered and get it fixed. it’s driving me crazy. Ok, I have a LG front load washer. Model #wm2277hw. The tub bearing needed replaced (it was making an aweful racket while spinning) so I replaced them. After getting it back together, I now get the error code “de”. I have checked the door alignment and seal and it all looks good. I replaced the door lock mechanism as well. I am still getting the error. I never even touched the door lock other than to umplug it so I could get the front panel off to replace the bearings. What could be the problem? My LG Front Load WM2250CW is getting the DE error frequently, but not always. Sometimes, by “playing” with the door I’m able to make it work again…, but sometimes it stops again at the middle of the cycle. Would this be a problem in the door lock system, or should it be more a door alignment issue? Lg top load washing machine keeps showing DE after it has finished setting water level. 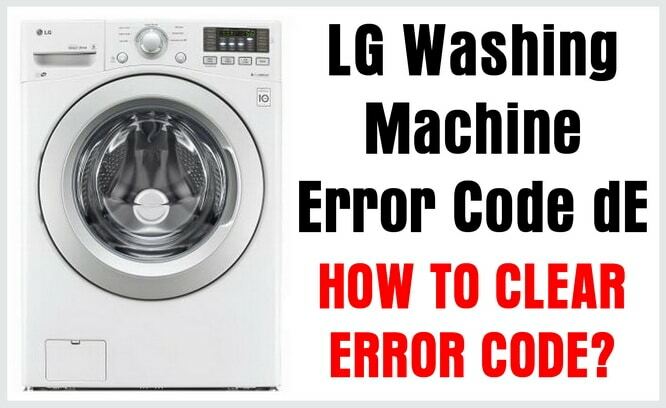 Have you read and tried all methods above on the LG WASHER DE ERROR CODE page? Previous post: GE Dishwasher Flashing Lights And Beeping – How To Reset GE Dishwasher? Next post: Samsung Dryer Error Code E3 – How To Clear? – What To Check?